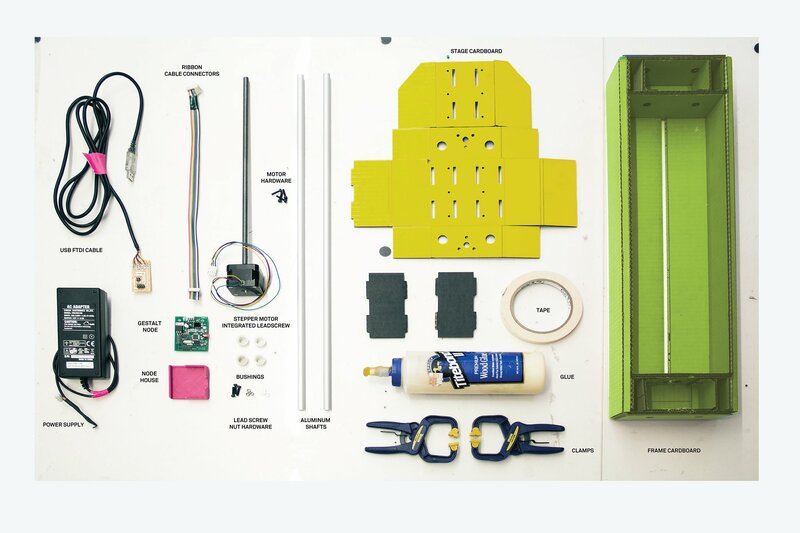 A framework for the rapid prototyping of rapid prototyping machines. 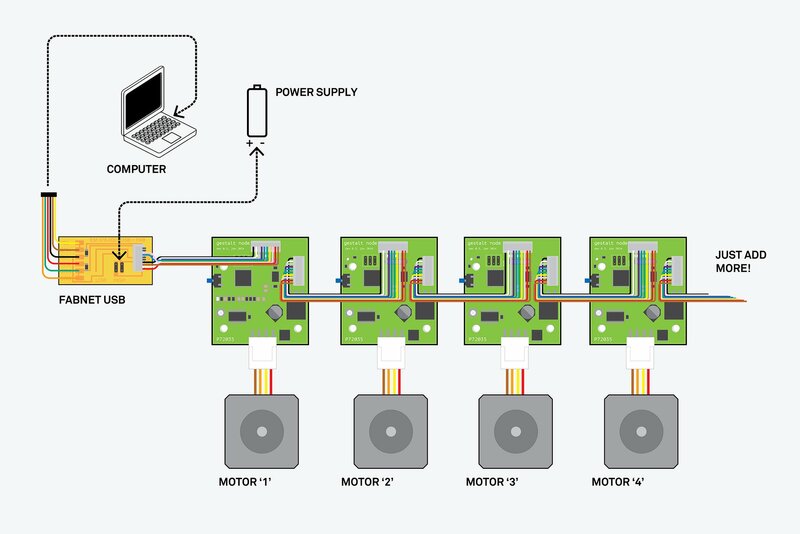 Modular hardware, modular electronics, and modular software. 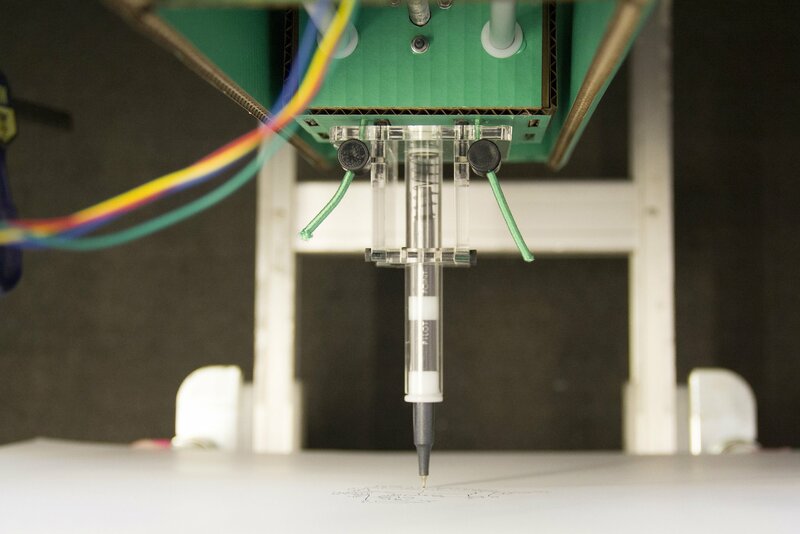 2 Axis drawing machine produced with the below instructions. 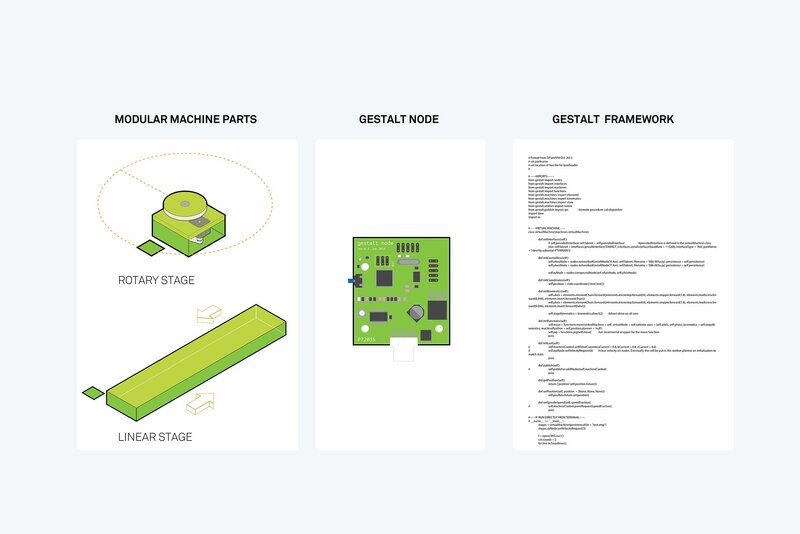 What is Gestalt and the Modular Machines that Make [m]MTM? "an organized whole that is perceived as more than the sum of its parts." 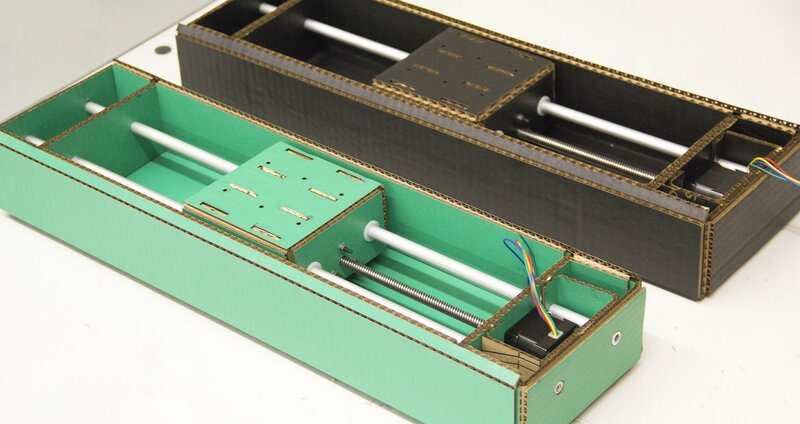 Nearly endless kinematic options from simple parts. 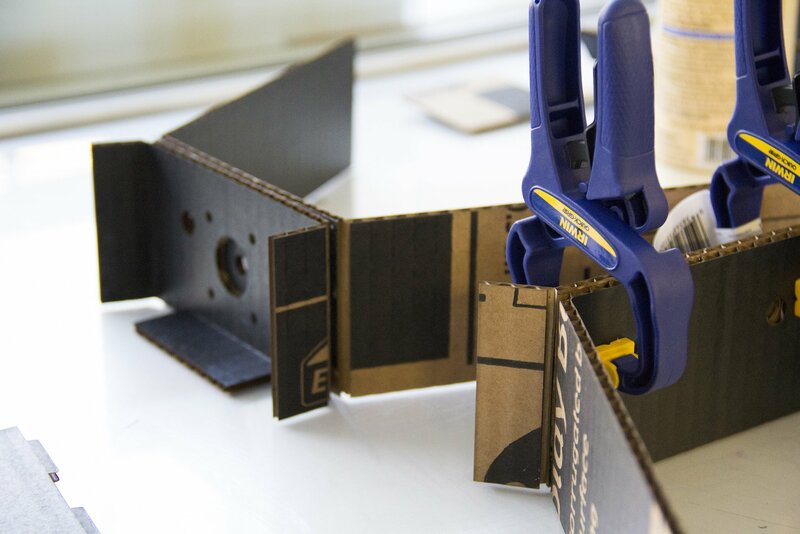 Cardboard is a great material for machine prototyping because you can cut, glue, tape, laminate, slice, and fold with ease! Since the material is cheap, iteration is a breeze! We use science fair style trifold presentation boards because they are colorful and so we can claim they are made from 100% science. Download the cardboard cut files here, designed for .15" thick stock. Note board one is cut face/color up while board two is cut facedown. 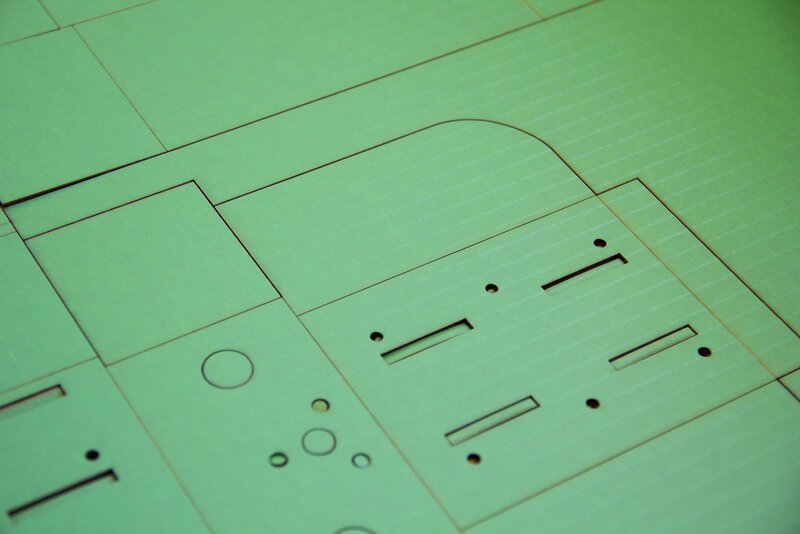 If you desire a different machine dimension or have stock of a different thickness use the parametric model to adjust! Etched lines should be cut through the top later and corrugation but not through bottom layer. Necessary parts for one cardboard linear stage. Bill of materials [BOM] follow this link to our list of necessary materials. Each layer must be laminated together to achieve maximum stiffness. Motor installation happens mid assembly. Fully assembled linear stages ready for electronics to be added. 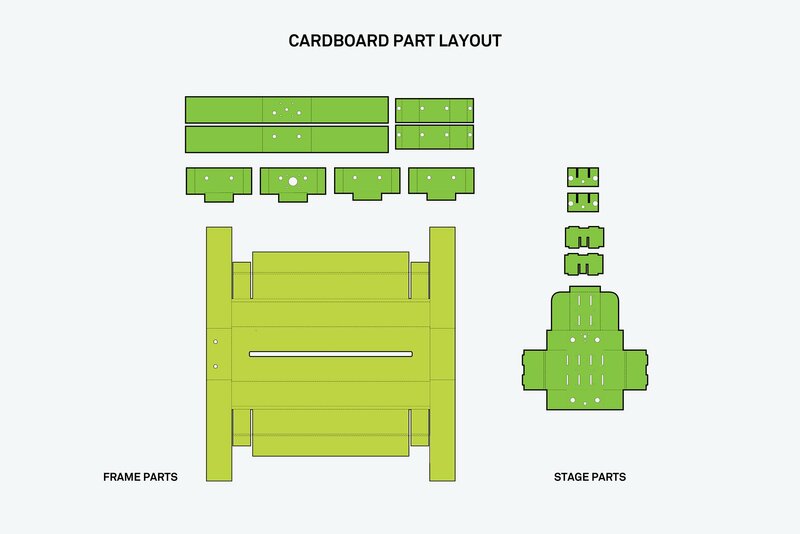 Have a look at the Construction Kit for clever ways of connecting the stages together. Now that the stage is complete we will need to download the required software to program and communicate with the Gestalt Nodes. 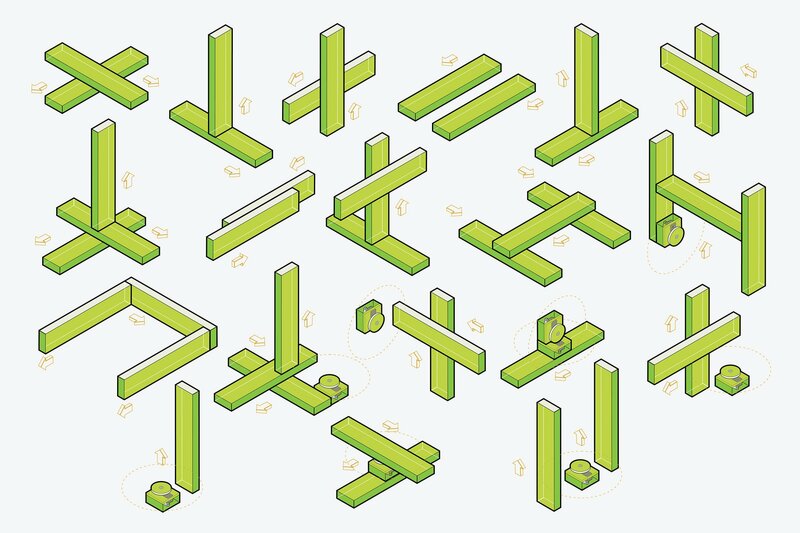 You can clone the latest Gestalt library from GitHub here. Once you have the Gestalt Framework downloaded and installed, it is time to program the nodes. Use the below wiring diagram and Makefile. 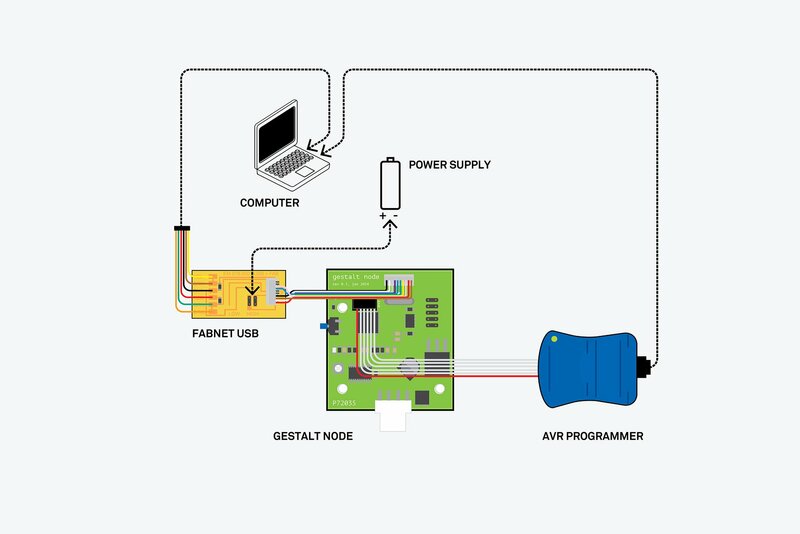 Programming your Gestalt Node with and AVR. Note The Fabnet to node connector is not typical! Once boards are programmed we can plug everything together! In order to talk over serial we need to install pyserial. Be sure to pay close attention to connector orientations! How do I talk to the nodes? See below for an example 2 Node network. You can run this from the terminal directly, or you can import the virtual machine into your own python program. Everything needed to start moving! Pen not included! 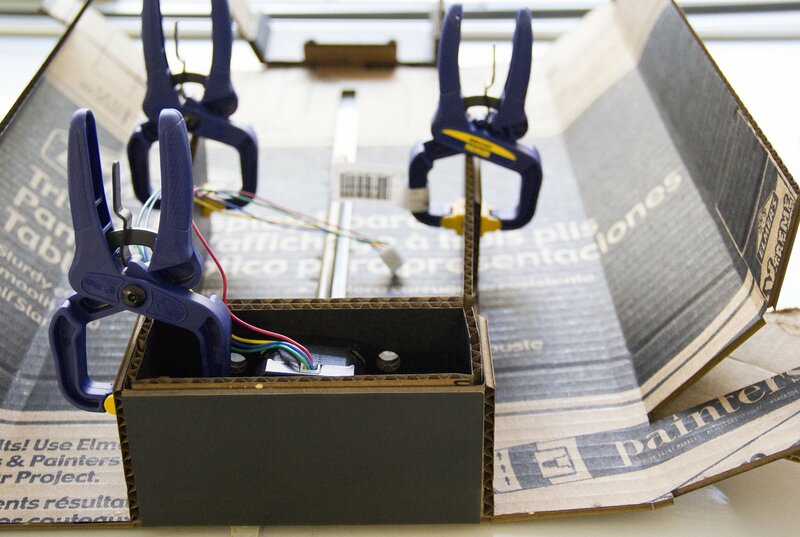 Following wiring diagram above, plug fabnet board to gestalt node and attach motor. Connecting multiple Gestalt nodes together is as simple as adding another cable! See below how to attach another Node to your first node we connected to the Fabnet board. Wow look how easy that was! Have a look at the daisy chain diagram above to verify the correct connector orientation. Ready to talk to the nodes? Great! Now lets plug in your USB and power the network. I'm using a salvaged 12V 5.5A power supply. Watch carefully as we identify the respective nodes in the network. Here we press the button on the Gestalt nodes when prompted for "X Axis" and "Y Axis". Watch how we assemble all the parts for our 2 axis machine and follow the steps for identifying Gestalt nodes. The LAST THING WE DO is power the network! 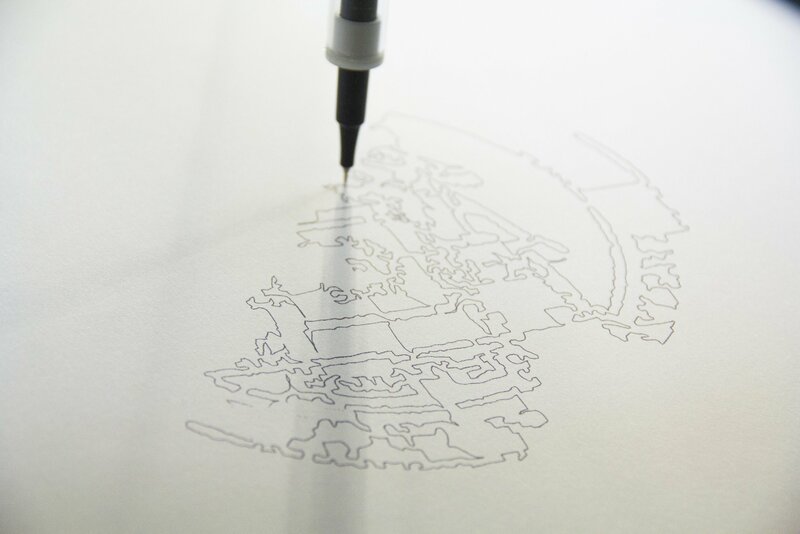 Drawing in process with springloaded pen capture and nylon quick connect straps. 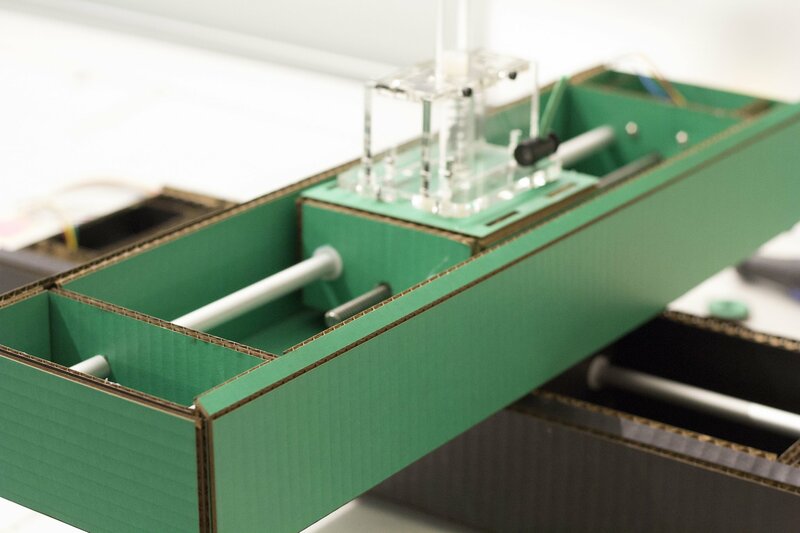 The Modular Machines that Make project is a collaborative project born out of the 'Machines that Make Project' inside the Center for Bits and Atoms at The Massachusetts Institute of Technology. Current research also sponsored by the MIT - SUTD Collaboration and International Design Center.